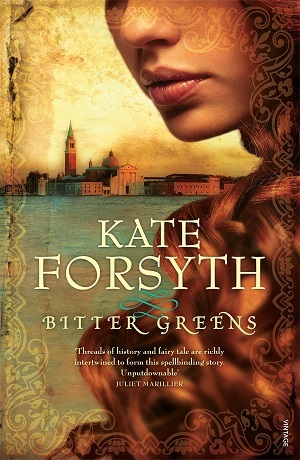 Kate Forsyth wrote her first novel at seven, and is now the award-winning & internationally bestselling author of more than thirty books. 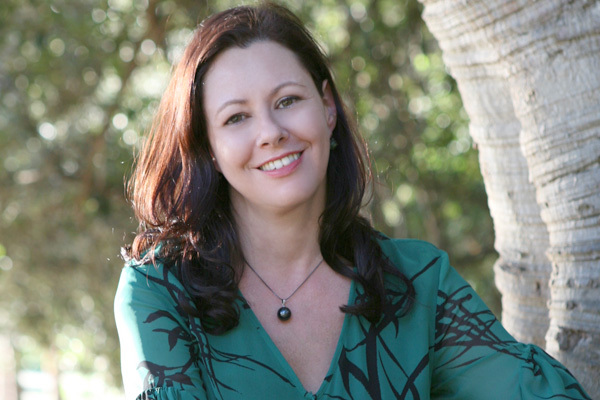 Recently voted one of Australia’s Favourite 20 Novelists, Kate has a doctorate in fairy tale studies and is an accredited master storyteller. Her adult books include The Wild Girl, the story of the forbidden romance behind the Grimm Brothers’ famous fairy tales, and Bitter Greens, called “the best fairy tale retelling since Angela Carter”. It won the 2015 ALA Prize for Best Historical Fiction and came in at No 27 in Dymocks 2015 list of Australia’s Top 101 Books. 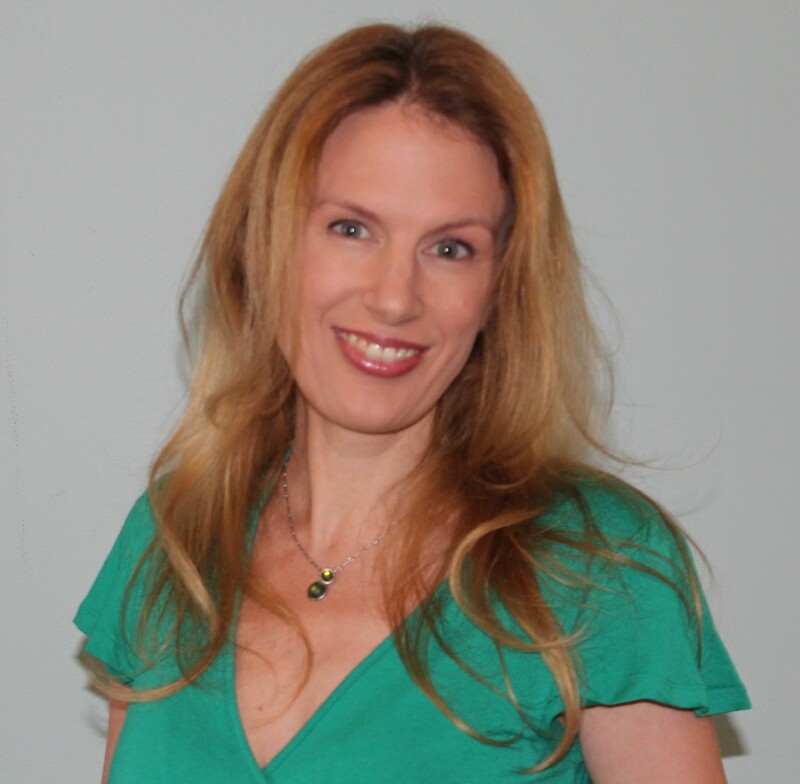 Kate’s children’s novels include The Impossible Quest, The Puzzle Ring and the award-winning The Gypsy Crown. Kate is a direct descendant of Charlotte Waring, the author of the first book for children ever published in Australia. I always knew I wanted to be a writer – it was like a mystical destiny for me. I never changed my mind or wavered from my course. I began writing as soon as I could hold a pencil and I have never stopped. I wrote my first novel when I was seven, longhand in an old exercise book, and wrote at least one every year until I was sixteen or seventeen, and my final school exams got in the way. I first tried to be published at sixteen and got a very nice encouraging letter from the publishing house to which I had sent my manuscript. I went to university and studied literature, and began to get poems and short stories published. I was working away on a novel the whole time, and tried to get it published a few more times without success. After I graduated, I worked as a journalist until I was in my mid-twenties and then I quit full-time work and went back to university to do a Master of Arts in Creative Writing. I could not believe that I was 25 and still had not had a novel published! I felt as if I had to do something drastic to make my dreams come true. I worked part-time as a freelance journalist and tried to make sure I got at least two or three days a week to work on my novel, which I planned to use as my major thesis. By the end of the year, that novel was finished and so – in the summer holidays – I began to write another. I threw myself into it with absolute passion and commitment, and by the time the university term began again, I had written about fifty thousand words. I felt, with a little fizz of excitement in my stomach, that it had something … and so I sent it off to a literary agent in the hope she would represent me. She loved the book, and put it up for auction in Australia and overseas … and before long I found myself with an international three-book deal. My life was changed forever! I have been a full-time writer ever since. 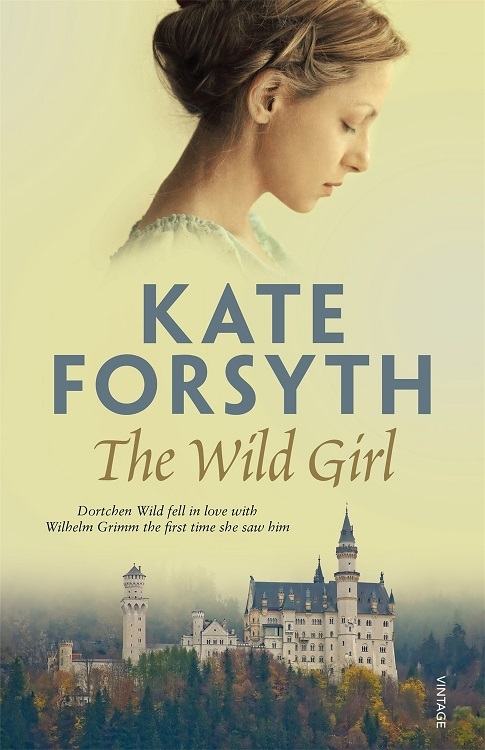 The Wild Girl is the story of the forbidden romance between Wilhelm Grimm and Dortchen Wild, the young woman who told him many of what are now the world’s favourite fairy tales. She and her sisters grew up next door to the Grimms, and Dortchen was best friends with Lotte, the only girl in the family. When Dortchen was eighteen, Jacob and Wilhelm began collecting old stories and rhymes and songs from their friends and neighbours, trying to save them from being lost. The little German kingdom in which they lived had been invaded by Napoleon’s Grand Army and they were living under French occupation. Dortchen knew a great many stories, and so she and Wilhelm (who was only 25) used to meet so he could write down the tales she told him. She was the source of almost one-quarter of all the stories in the first edition of the Grimm brothers’ Children’s and Household Tales, published in 1812. Her tales included “Six Swans”, “Sweetheart Roland”, “Hansel and Gretel”, “The Frog King”, “The Elves and the Shoemaker”, “Rumpelstiltskin”, “Toads and Diamonds”, “All-Kinds-of-Fur”, and “Fitcher’s Bird”, a very gruesome version of “Bluebeard”. As Dortchen told Wilhelm these beautiful, romantic and eerie stories, the two fell passionately in love. However, Dortchen’s autocratic father did not approve of the impoverished Grimm family and so he forbade her to see him. Dortchen defied her father and met Wilhelm in secret, but – thanks to their poverty, the terrible impact of the Napoleonic wars and her father’s tyranny – it was to be many years before they were at last able to marry. The Wild Girl is the story of those years. 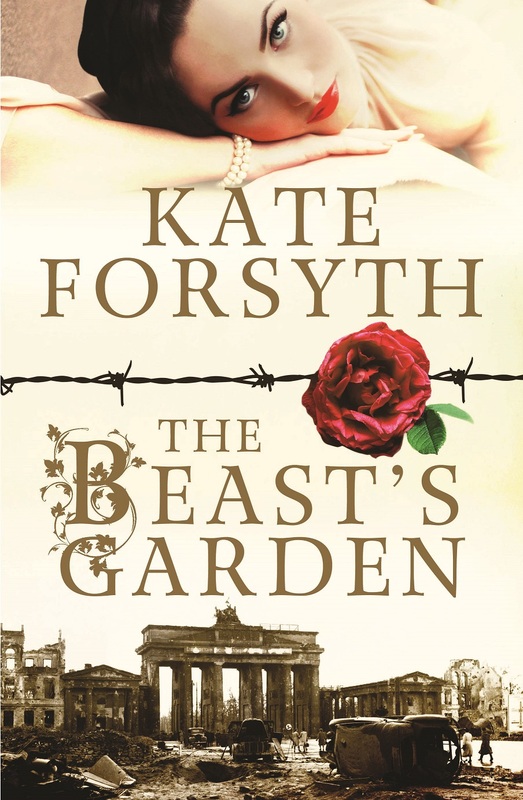 I also have a new historical novel called The Beast’s Garden coming out in Australia in August. It’s a retelling of the Grimms’ “Beauty & the Beast” set in Nazi Germany. I have a study at home where I write. It is painted pale green and is lined with books and framed book covers and artworks from my books. I have a beautiful view over my garden to the harbour and the ocean. On my desk I have a jar stuffed full of raven feathers – they are always dropping them at my feet! I also have a piece of broken glass that looks like an angel wing that I found when I was a teenager. I also have a large green gargoyle that I bought from an antique store many years ago. I have a comfortable wing armchair with a cushion on it printed with one of my poems where I like to sit and read. It is a very beautiful and tranquil space, and I miss it terribly when I’m away from home touring and doing research trips. I like to have a cup of tea and write in my diary first thing in the morning, preferably while I’m still in bed. 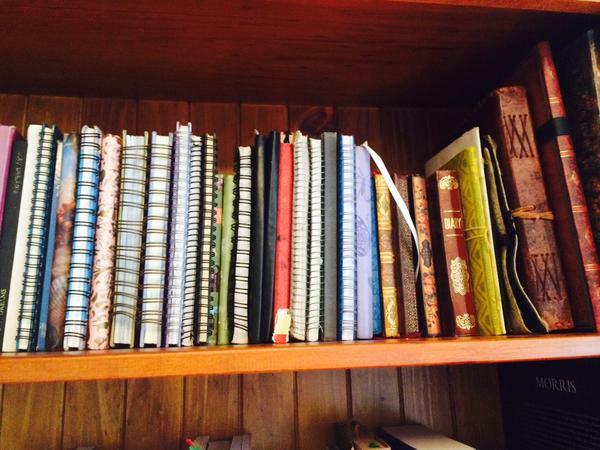 I’ve kept a diary since I was 12, and so I have a whole shelf of them in my study – about sixty volumes in total. 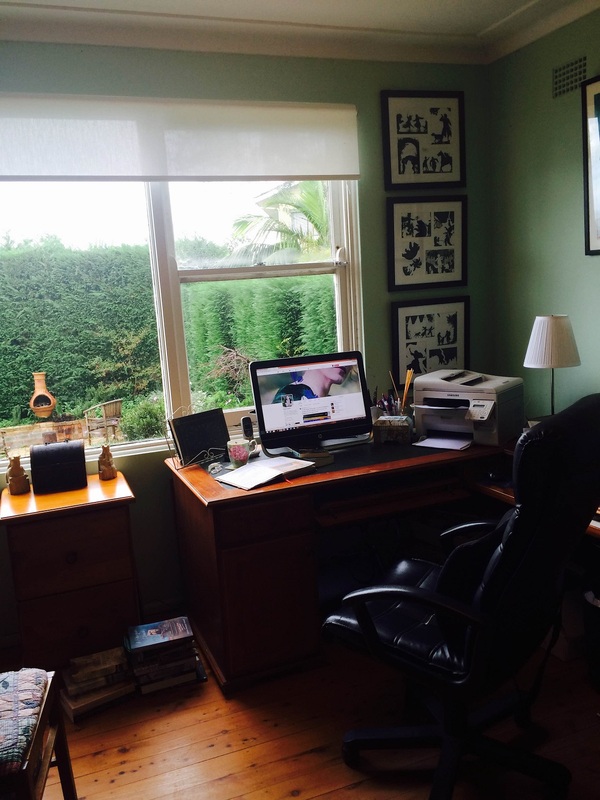 I write most days – and miss it when I’m too busy. Then I have breakfast with my daughter (my two older boys leave for school at what sometimes seems the crack of dawn!) I have a quick look at my emails and social media while I eat. Then I have a quick whizz around and get as much housework done as I can before it’s time to take my daughter to school. Once I’ve dropped her off, I walk with my dog along the ocean front for an hour, then go home. I make a cup of tea, turn on my computer and answer any important emails. Then I settle down to work. I read through what I wrote the day before, and cut and polish and rewrite, then I try and push the story forward. My husband makes me lunch, which we eat together (he works from home too), and then I go back to work. Most afternoons, I pick my daughter up from school at around 3pm, make her afternoon tea, listen to her day, then settle back to work again. The boys get home between 4.30 and 5pm, and often need to be picked up from the bus-stop – my husband and I take turns with that. Some nights I cook, and so will stop work to get it all ready. Other nights he cooks, and so I work through until dinner-time. Then I usually help the kids with their homework, do a few more household chores, and maybe watch a little television – before settling down with a book for a couple of hours. This is often reading for research. If I’m deep into a scene and want to finish it, I’ll go back to work for a few more hours after dinner – but I only do this when I’m getting close to the end of a novel and it’s consuming all my attention. I spend a lot of time thinking about the book, playing with ideas, and doing my research before I start to write. I work in a notebook, and may spend months daydreaming and planning before I even think of starting to put words on paper. I like to know my characters and my plot as fully as possible before I begin. That means the writing process is swift and sure, and I don’t get stuck. Once I start writing, I like to be hyper-focused and have as few distractions as possible, so I normally try and keep my diary clear of appointments (my friends and family miss me during these periods!) My adult books are big and intense, so it normally takes a year or more to write –and sometimes I will have taken a year or more to research and plan too. So I often alternate between writing for adult and children, so that I am working on smaller and less intense books during the day, and doing all my research at night. I like to finish the first draft of a novel before I start doing any major cutting or rewriting, so that I can see the shape of the novel and get a sense of what I need to do. But sometimes I need to take a few weeks to revise the novel whilst in the midst of it, usually because the writing has thrown up new ideas or new challenges that I was not expecting. I’m very steadfast and focused while I’m writing – I find it hard to spend time away from the book and all of my reading will be what I need to make the book better. When I’m finished, I send it off to my agents and publishers, and hope they like it! Sometimes books need a lot more work before they are ready to be published, and other books do not – it is never the same. So the editorial process can take a while sometimes – but I always love this process, the final cut and polish. After I finish a novel, I usually write a few small pieces – essays, poems, stories, picture books – before I begin work on the next one. Oh, and I try and catch up with friends and family! Because I love it. Because it makes me happy. Because I feel it is what I was born to do. Inspiration comes in many different ways, and it is always surprising and mysterious and beautiful. I read a lot, and so many of my ideas come from books. For example, I first got the idea for The Wild Girl when I was reading a scholarly book about the oral sources of the Grimm brothers’ fairy tales. I was struck by how many stories came from one source – a young woman named Dortchen Wild – then I discovered later in the book that she and Wilhelm ended up getting married. The first idea for my children’s novel The Puzzle Ring came when I was flicking through a jewellery catalogue and saw a puzzle ring, and read a paragraph about how the first one came to be made, and thought idly to myself, what a great thematic structure that would be for a quest story … a search for a broken puzzle ring. Writing is the job of an obsessive. You cannot spend so many days, months, even years, working to bring a story to life and not be totally focused and committed to that task. Sacrifices must be made. This can be hard for the people who love you, who sometimes feel that you put the writing ahead of them. It is also an emotional rollercoaster. When the writing is going well (or when you win a prize or get a glowing review), then you are flung up into the brightest and happiest of states. And when the writing is slow and difficult, and the story keeps throwing new challenges in your way, or when you don’t win a prize or you get a negative review, then you are flung down in the black depths of despair. So you need to learn to be resilient, and conserve your energies, and learn to judge when to listen to criticism and when to ignore it. This is probably the hardest part of the whole job, as we are sensitive souls and feel things deeply. However, if you don’t learn resilience and faith in yourself, then you will never survive. All I want is to write the stories that are given to me in the very best way I know how … and to be able to make my living from that work. Writers are constantly being asked to write or speak for free, and I think it’s such a shame that we are not accorded the same professional respect as plumbers or dentists or garbage collectors. And thank you, Danielle Wood, Natasha Lester, Pamela Hart, and Valerie Khoo, for all recommending Kate! You can also read my recap of the fairy tale panel Kate chaired featuring Danielle Wood, Garth Nix & Wanda Wiltshire at Sydney Writers’ Festival here. I’ve got both ‘Bitter Greens’ and ‘Wild Girl’ on my ‘to read’ bookshelf! Must find the time soon – I know I’ll be inspired. I’ve been very excited to read Bitter Greens. Now I have yet another reason.